Bukit Timah Hiking.. The Trails.. 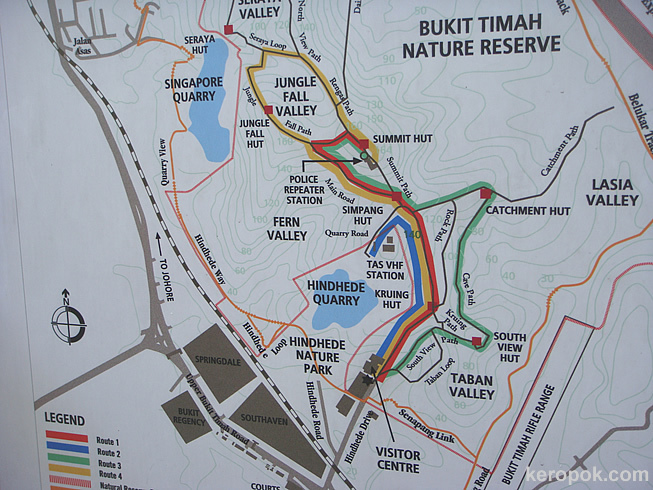 The different route you can follow if you decide to hike at Bukit Timah Nature Reserve. When I took this photo last weekend, we all took the 'green route' up, and the 'red route' down. It was a good walk. 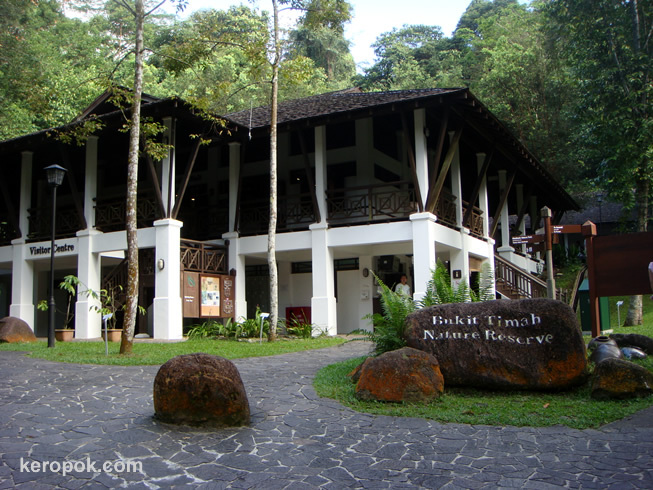 The visitors centre at the Bukit Timah Nature Reserve. It's a place where everyone 'meets' before they go for a hike. Bukit Timah is the highest hill in Singapore. It stands at 164 metres. :-) Which means many tall buildings in Singapore are actually higher than this hill. Do you like hiking? When was the last time you went to a hike? 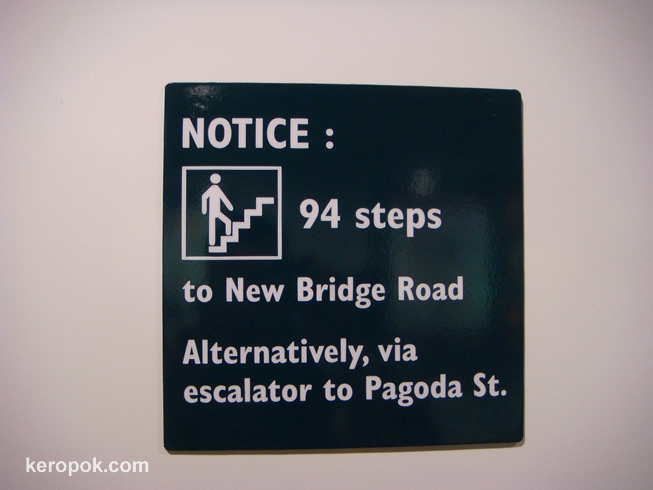 This was spotted in one of the underground train stations in Singapore, the Chinatown Station at the North East Line. Are you game for it? Walk up or take the escalator? a chinese equivalent of a Christmas Tree? Looks pretty don't they? These are not roadside plants. 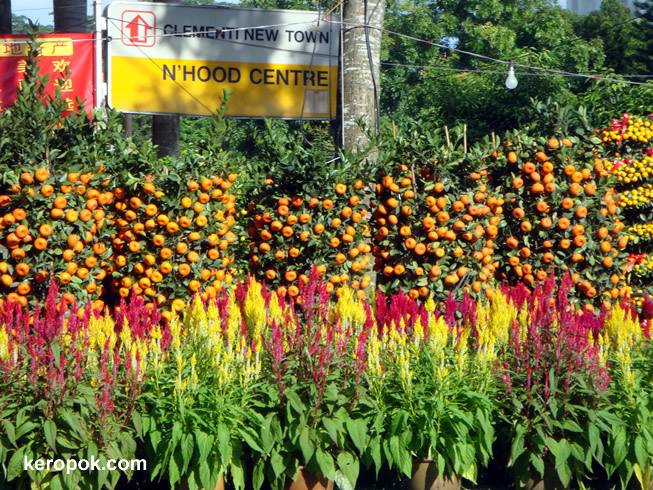 These are individual potted plants that are for sale for the coming Chinese New Year. Many people like to buy these plants for decoration as it has symbolic meanings. The plants in front are flowering plants that have reddish and yellow colours, both auspicious colours too. All for sale by this corner shop in Clementi, Sunset Way. They are only for sale during the Lunar New Year period. Haha.. something like a "Chinese Christmas Tree" equivalent? LOL. Yes, people do put decorations on them too! Do you buy plants for decoration at any festive season? red and orange colours rules during CNY. Scenes of Chinatown. This will be what I will be posting here in Daily Photos these few days. It seems Reddish and Orangey colors rules! Do you have a Chinatown in your city? Do you visit it often? For me, I only visit it during Chinese New Year! 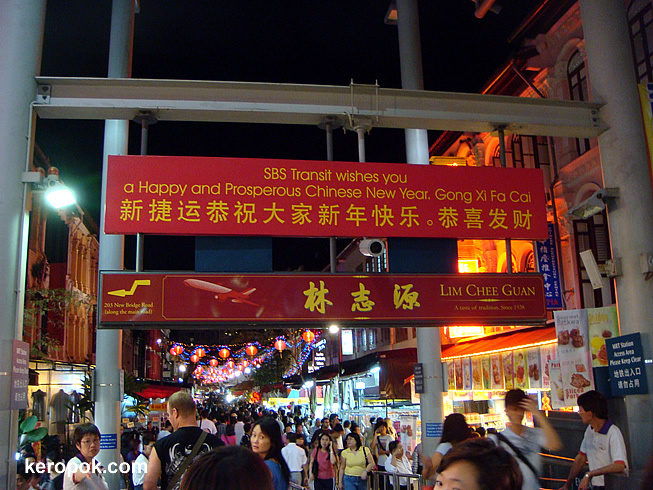 sbs transit and bak kwa stalls welcomes you to chinatown. It's getting nearer to the Chinese New Year. Chinatown is such a hive of activity. Last nite I walked the streets of Chinatown to 'absorb the atmosphere'. haha.. Many people do that for the fun of it. Squeezing with thousands of people along the roads in Chinatown with stalls displaying their wares. View the photo I took in February last year here of the same entrance. The only difference is that the station number and name has been replaced with a Bak Kwa shop's advertisement. I know most people hate crowds. But, do you sometimes like me just join the crowds for the fun of it? 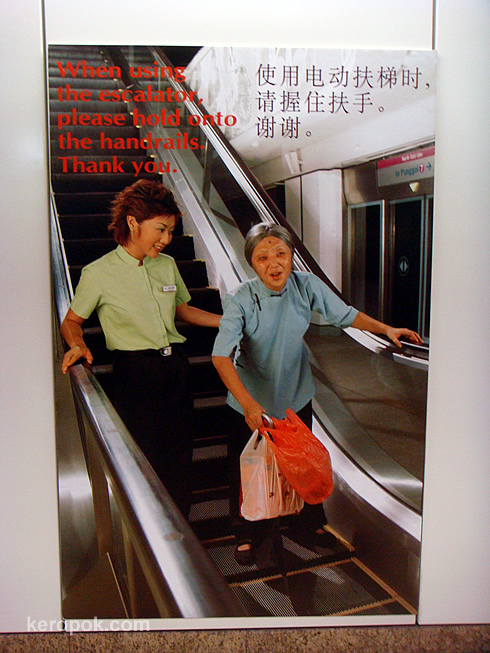 haha..
Every time I see this poster in train station, I want to laugh. The person is not a train personnel though she is wearing the SBS Transit train uniform. She is actually a very emcee, comedian and host on the local TV. Her name is Quan Yifeng. By the way, what do you do on weekends? This thing cleans the roads for us. 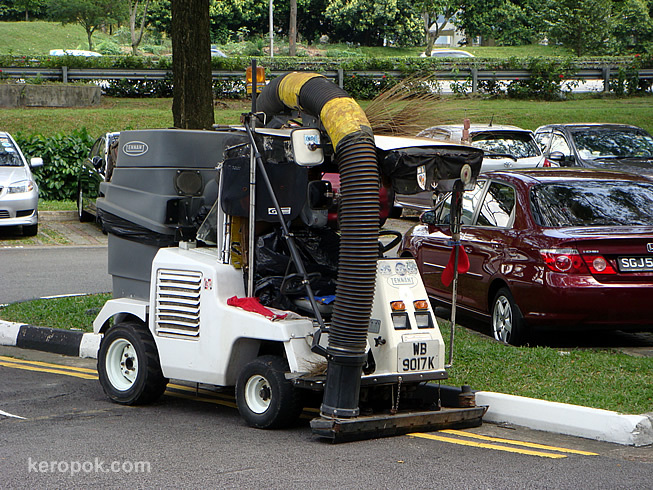 machines like this cleans many parts of Singapore. Human sweepers can still be seen too. if only there's a robot that cleans our house for us. haha..
do you like doing housework? spotted in a shopping mall. what interesting names these two shops have. "miss whatever" and "girls". 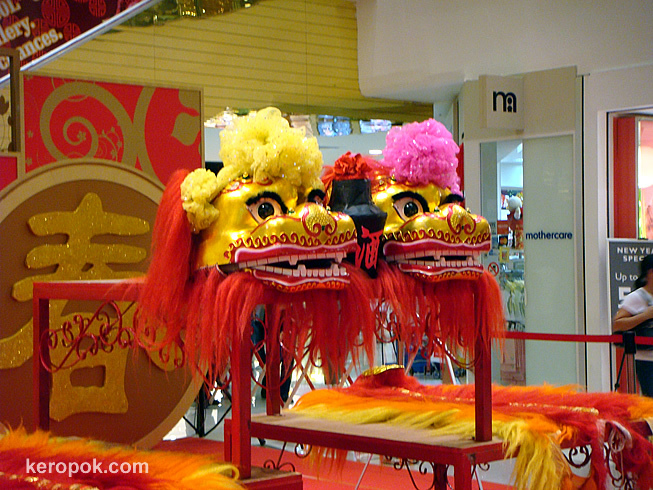 This is not Simba's head, but two heads that belong to the two lions that's going to perform the Lion Dance. This was spotted at The Centrepoint. 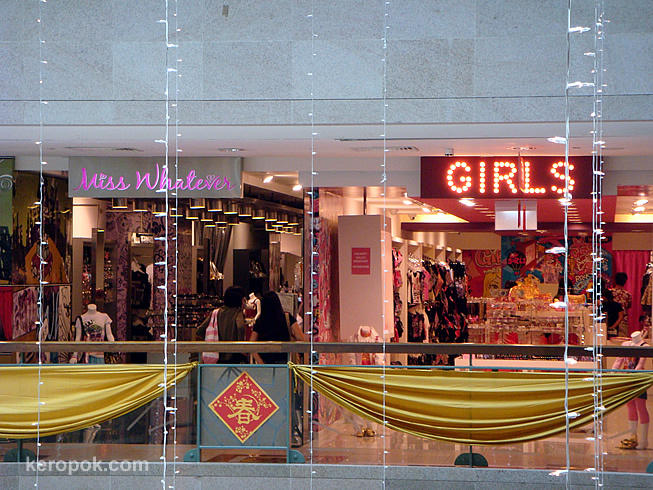 One of the popular shopping malls in Singapore. They are popular during Chinese New Year. If you are interested, you can read more at wikipedia. Have you seen a Lion Dance performance? no smoking, no food and drinks, no durian, no pets. 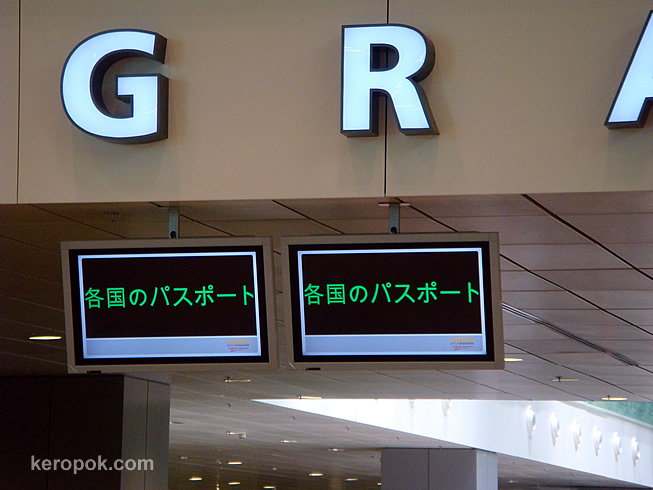 How do you interpret the sign? 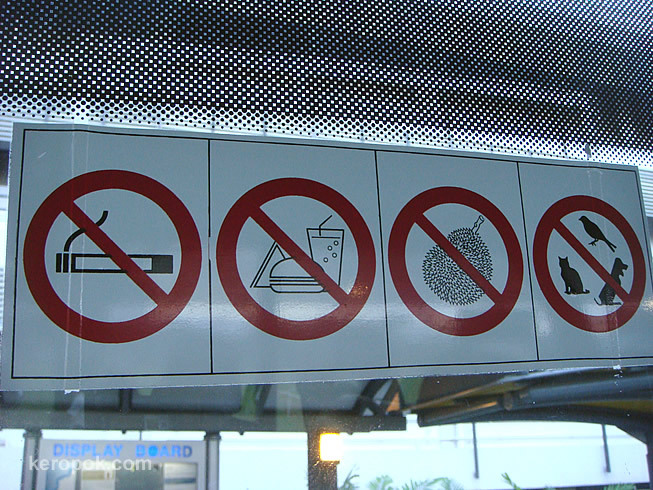 no smoking, no food and drinks, no durian and no pets right? I guess you can only find "No Durian" signs in Singapore (and maybe Malaysia). It's usually found in public transportation. 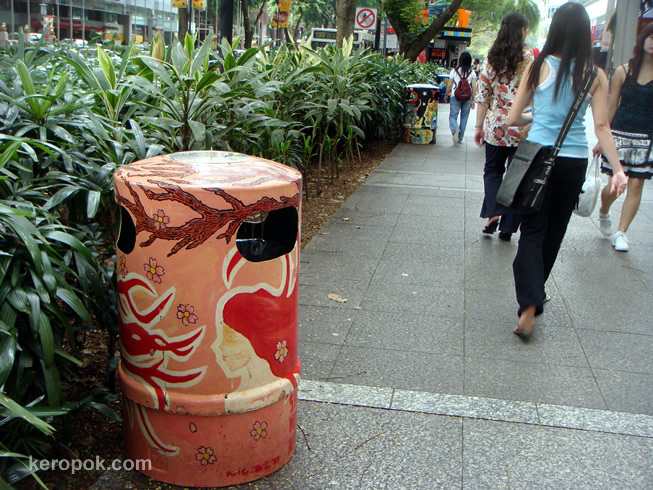 88 of these 'arty' or I would call them 'designer' garbage bins are around Orchard Road. people behind them are Creative Home, a youth project to encourage them to take ownership of the environment. 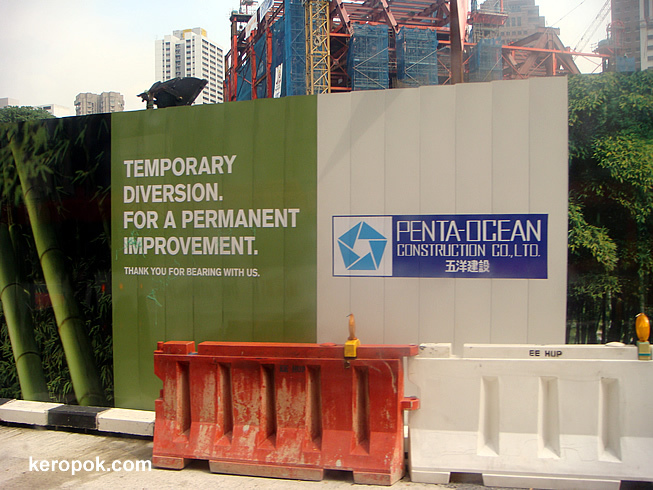 No more dull green garbage bins along Orchard Road. You can see 3 of them in this photo. Do you know that there's a voting contest too? If you have seen them around, view the designs and vote for your favourite. You can visit Creative Home for more information. Here's a shortcut to see all the designs and participate in the contest. Just wondering.... Does the fast food restaurant near you have promotional items on sale? This is at the golden arches. 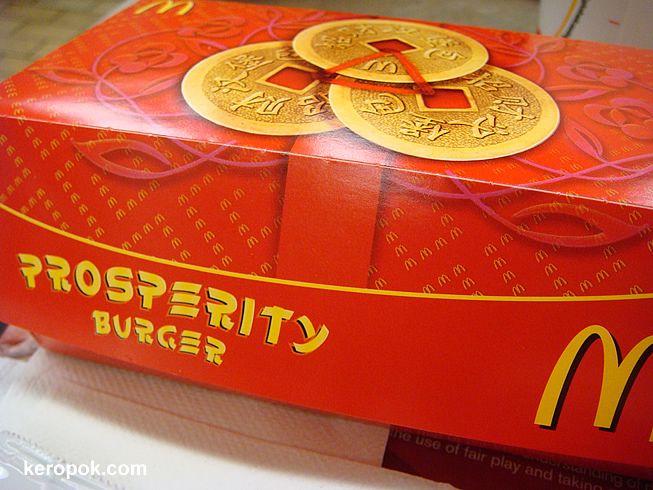 They are having promotional burgers called Prosperity Burger. It is the promotional item for the Lunar New Year. Hmm do you prosper by eating them? Maybe. The weighting scale will tell you that you have indeed prospered. haha..
i took this same photo from my food blog. do you take spicy food? this is sambal sotong. Definition of Sambal in Wikipedia. 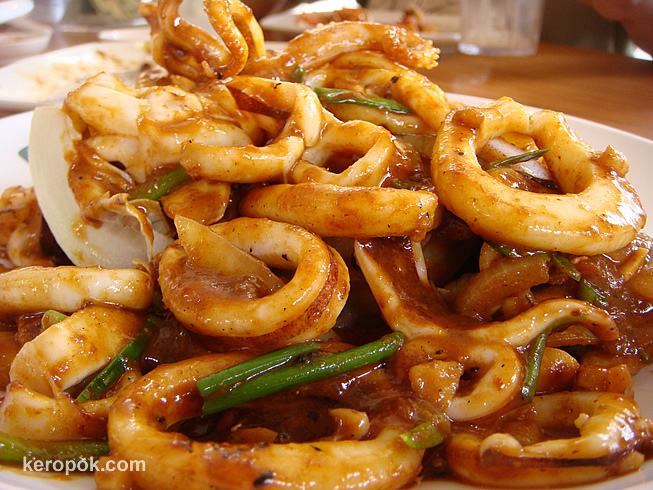 Sotong = squid in the Malay Language. Have you tried this? Can you get this in the city that you are living in? temporary diversion. for a permanent improvement. what have you set for yourself in 2008? Goodness gracious! 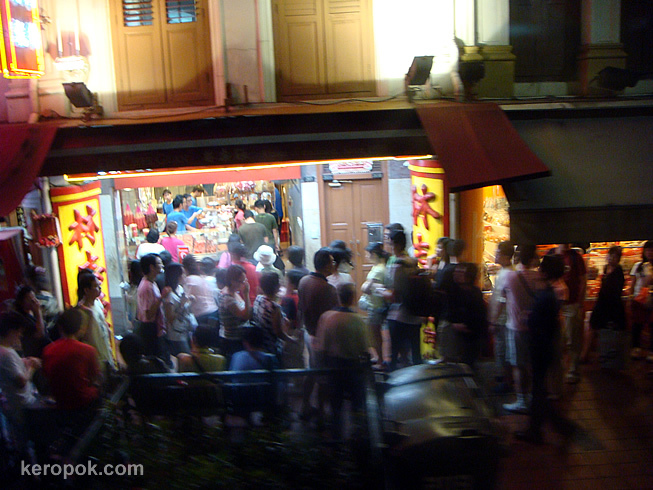 This was taken a few nites ago at Singapore's Chinatown. Snaking long queues of people lining up to buy slices of BBQ Pork Slices called 'Bak Kwa'. 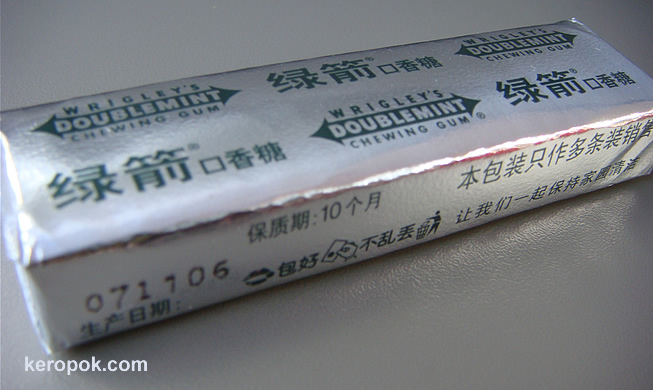 It is also called the asian chewing gum! Something like beef jerkeys, but 100 times better. It's one of the gifts that you buy for friends and relatives during the Lunar New Year. Bloomberg had a Bak Kwa index last year, wonder if they will be having it this year. What is the thing that people are queuing for in your city? Can't wait to get their hands on it? towkay ho seh boh? 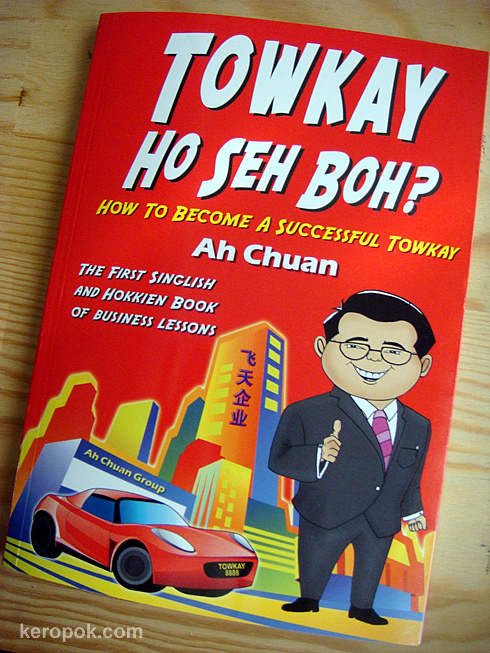 ... how to become a successful towkay. I was given this book to read. It's really a good read and a hilarious one too. It's something very Singaporean because of the language is a mixture of Singlish and Hokkien. If you have your enough of Drucker or Harvard Business Case Studies, get hold of a copy of this. It has very good business do's and don'ts. 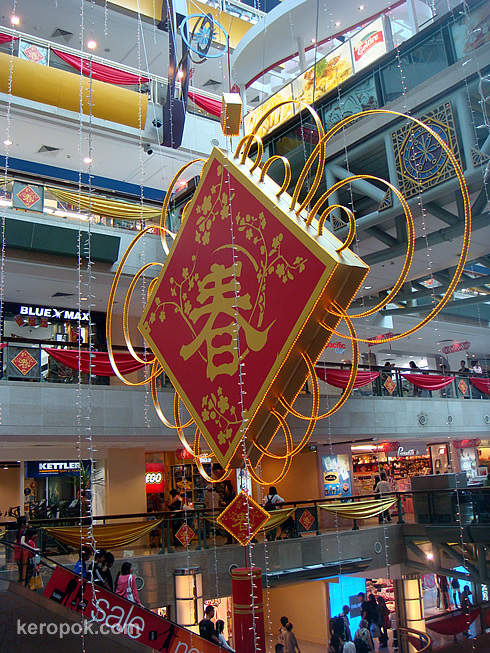 The Lunar New Year deco's already up in most places. This was taken yesterday at a mall called Plaza Singapura. 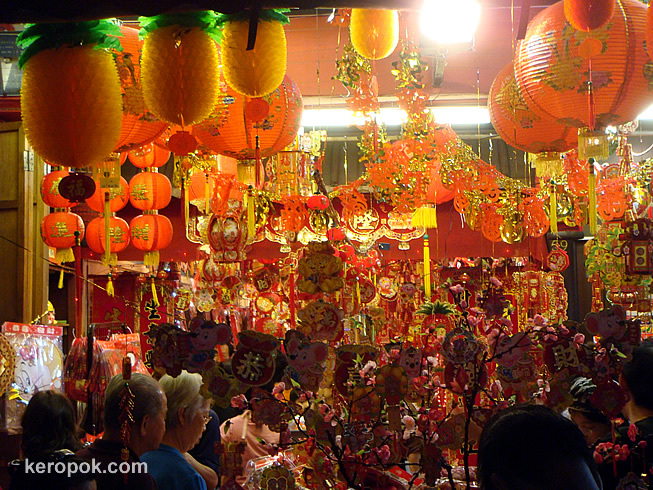 Do you celebrate the Lunar New Year? Not only Chinese celebrate them. Koreans and Vietnamese celebrates it too. In the Chinese Zodiac, 2008 is the year of the Rat! I am born in the year of the Rabbit, which year are you born in? Formerly the Old Hill Street Police Station, this building with colourful windows is now known as the MICA Building. 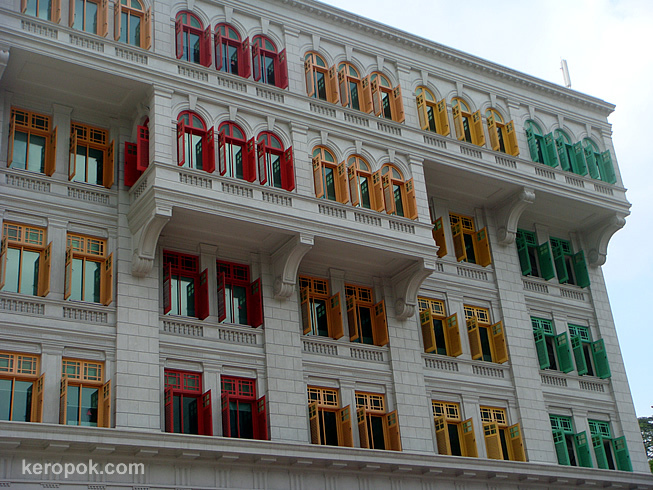 One interesting occupants of this building is the Singapore Kindness Movement. What was the kindness thing you did last week? 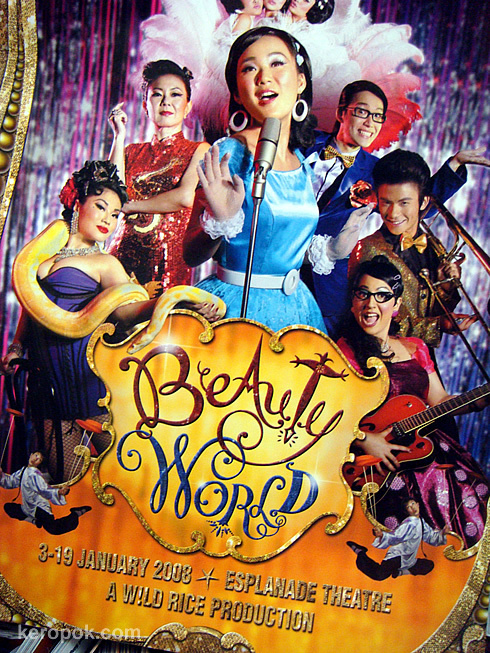 Today, my sis and I went to a very Singaporean musical, called "Beauty World". A snap of the program cover, since no photography is allowed during the show. We bought the tickets very long ago, so we had the 20% off for the matinee. Though quite an expensive ticket, but it was good! Do you all have a tune that rings in your head the whole day? if you want to know listen to that tune in my head, you can listen to it here. Wanna take a cruise? Singapore is known as the cruise gateway in Asia Pacific. 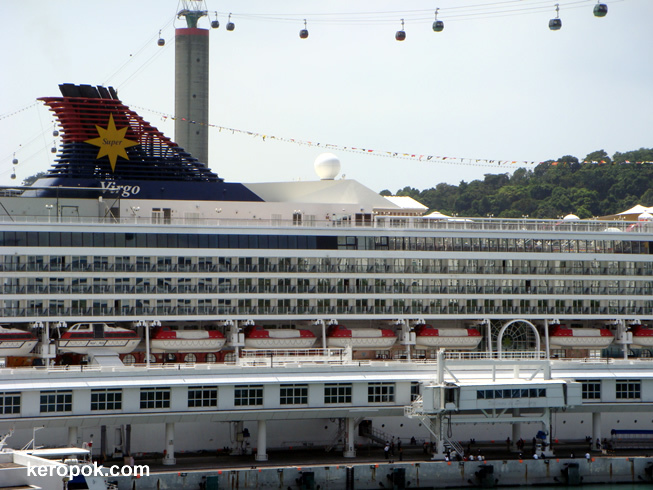 This photo is the Super Virgo from Star Cruise, a leading Cruise Operator in Malaysia and Singapore. On the background is the Sentosa Cable Cars, another popular tourist attraction in Singapore. Want to find out more about what time your cruise arrives? Visit the Singapore Cruise Centre website. my paper... free paper that is now a bilingual paper.. This is "my paper". A name of a free tabloid that this week gone bilingual. It is interesting that it has both English and Chinese in one paper. I happen to pick up a copy today while having lunch. You can also read the contents online. Visit www.mypaper.sg if you are interested to read about Singapore news. Does your city have free newspapers? Changi Airport's Terminal 3 opens today! It welcomes her first flight, SQ001 that flew in from San Francisco at around noon today. This is what arriving passengers will see. I am sure you are all clever enough. haha..
To those who arrived today, have an enjoyable stay in Singapore! The above are photos I took when I went for the Open House and these are the big screens at the Immigration counter. Friends from overseas, have you visited Singapore? Friends in Singapore, did you go to the Open House recently? 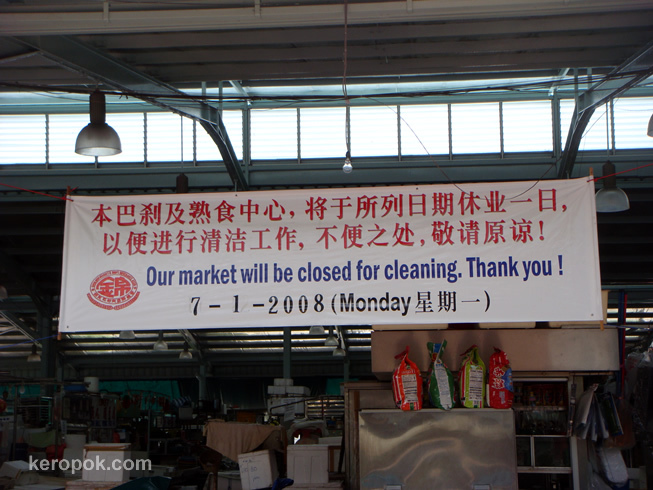 the fresh food market and cooked food market, closed for cleaning. Fresh food markets are also commonly known as wet markets. People generally do not go to wet markets on Mondays because supplies of vegetables and meat are limited or almost non existent. Some are even closed. Are you a fresh food / wet market person or do you buy everything from the supermarkets / hypermarkets? someone asked if i want some chewing gum. haha.. no, i have not had them for so long, i don't even want it in my mouth. this pack was different from the normal green ones we usually see, so i could not resist not taking a photo of it. do you know it's illegal in Singapore? so this is contraband! haha.. There's a legislation called "Regulation of Imports and Exports (Chewing Gum) Regulations." In it, no provision for personal consumption is stated. So technically it is illegal to bring in even a stick of it. Singapore Tourism Website & also Wikipedia. Oh yes, if it is chewing gum of therapeutic value, it is allowed after 2004, when the United States - Singapore Free Trade Agreement was signed. Do you like chewing gum? was raffles the plaza.. now fairmont singapore. Another view from The Padang. The left is the 42 storey office block at Raffles City. The middle is the tallest hotel in Singapore (73 storey, also the 6th tallest hotel in the world), Swissôtel The Stamford. The right is the twin tower hotel, Fairmont Singapore. 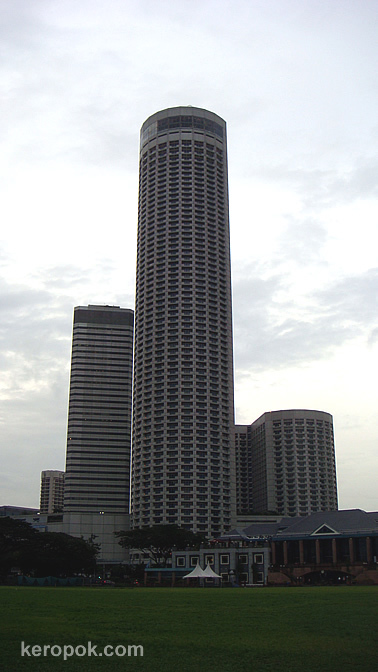 Fairmont was known as Swissôtel The Stamford until 12 December 2007. I had a peep at the rooms when friend's parents stopped over. So comfortable! Hope you have recharge yourself! It's the 2nd work week of 2008 tomorrow! Are you back at work since your year end break? This granite structure is located along the Esplanade. It's called the Cenotaph or known as also as "Our Glorious Dead". 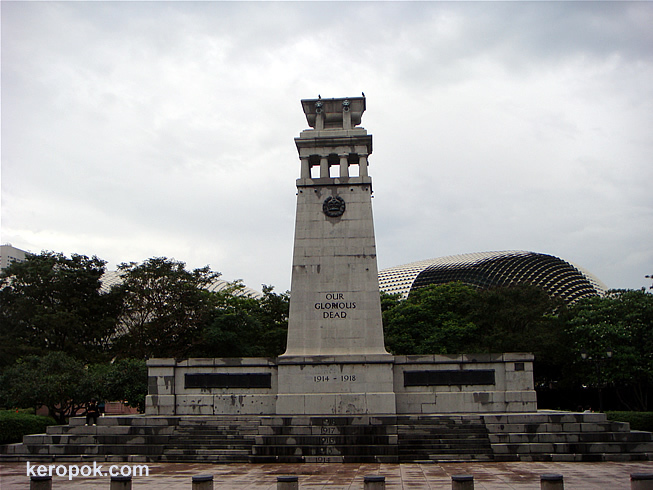 The Cenotaph located along Connaught Drive at the Esplanade, facing the old Courthouse, is a war memorial, which commemorates the sacrifice of the men who perished during World War I and World War II. It was unveiled on 31 March 1922 by his Royal Highness the Prince of Wales, Edward VIII. This was taken earlier today, in the evening as I was walking in the middle of the padang. the view of the tall buildings of mostly banks. Padang (in the Malay language) means field. 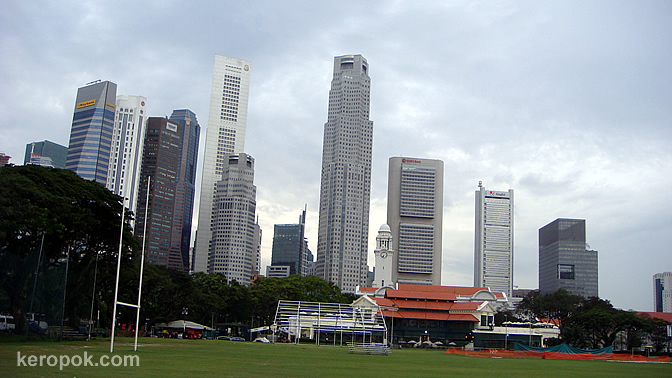 The Padang is also a well known open space in the CBD. You can read more about it at wikipedia. Just trying out taking the picture is wide screen mode on my camera. It's suppose to be in full HD mode. Hmm. Have a good weekend! How are you spending your weekend? 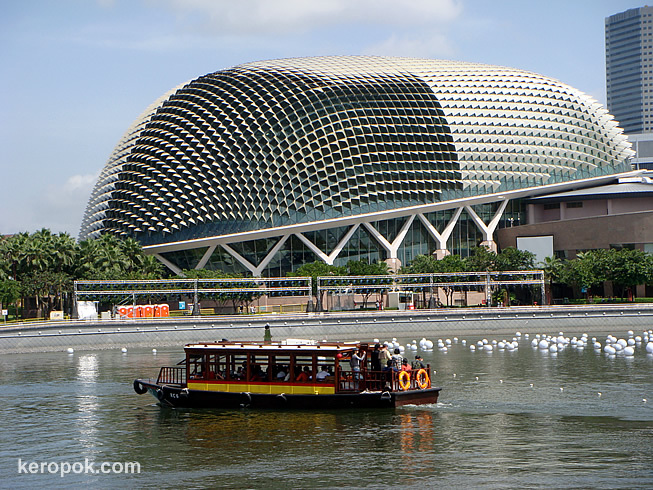 This is the Esplanade Theatres that appeared on the Theme Day photo. You can see tourist on the boat all standing up taking photos of the unique shape building. No one seem to be facing me! Those white balls on the water are Wish Balls, where wishes were written for the Countdown party held at this site a few days ago. I will be going there for a musical next week! 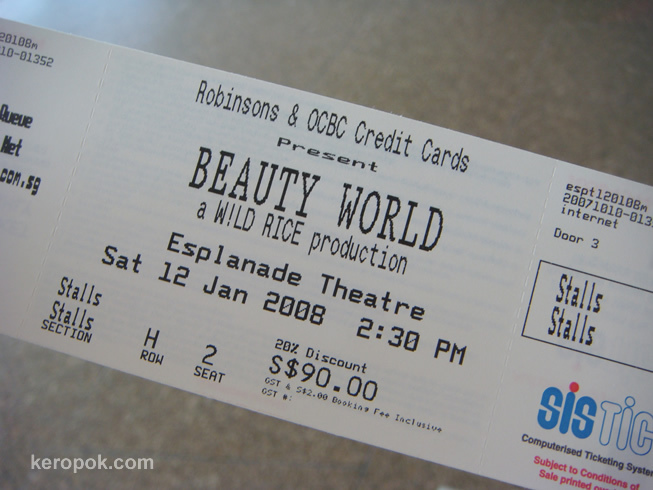 It has a very 'beautiful' name, it's called "Beauty World". It's a Singaporean production. 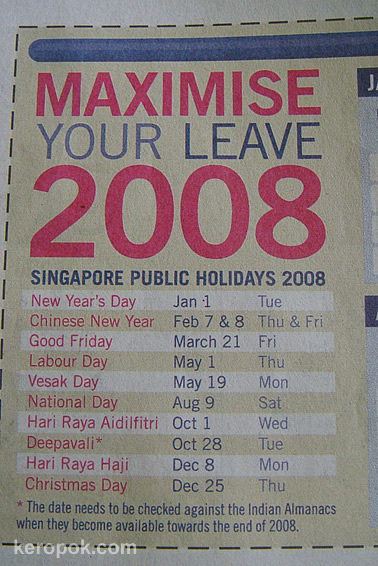 max your leave for 2008 : take 8 days, rest 37 days. It's only the second day of the year, and what are on people's mind? Planning holidays! This is what appeared on the Sunday papers a few days ago. Telling readers how to maximise their leave. Just take leave on those green boxes. 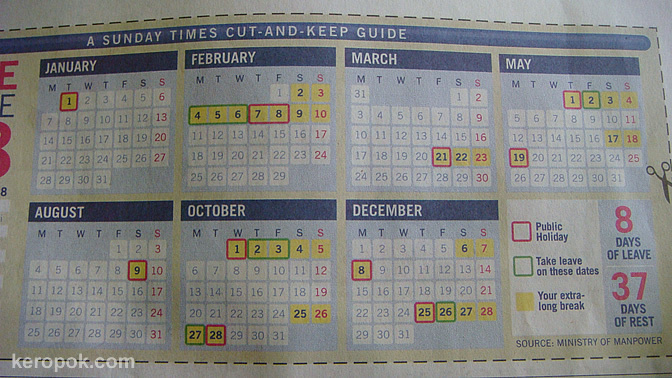 Combined with the public holidays, you just need to take 8 days of leave for 37 days of rest! Photos taken from The Straits Times. People in Singapore: Have you booked your leave? No, I have not. No plans for any holidays yet. haha..
People overseas: How many days of public holidays do you have in your country? A very Happy, Prosperous and Blessed New Year to all. It's Theme Day again and the theme is Photo of the Year. This photo is the last few photos taken on the last day of 2007. 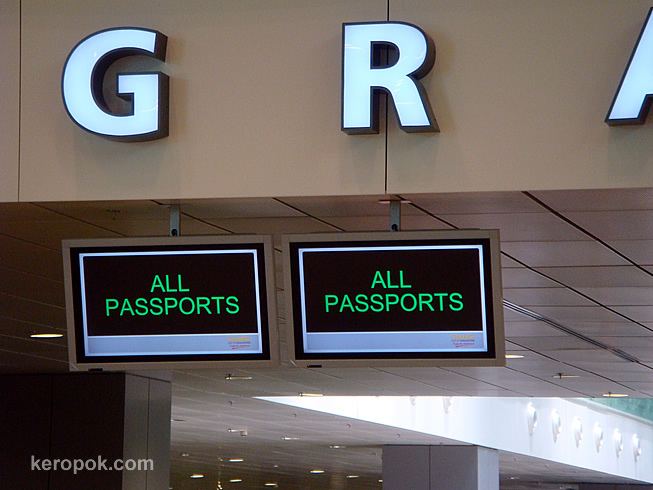 It clearly shows 2 distinct Singapore icons. 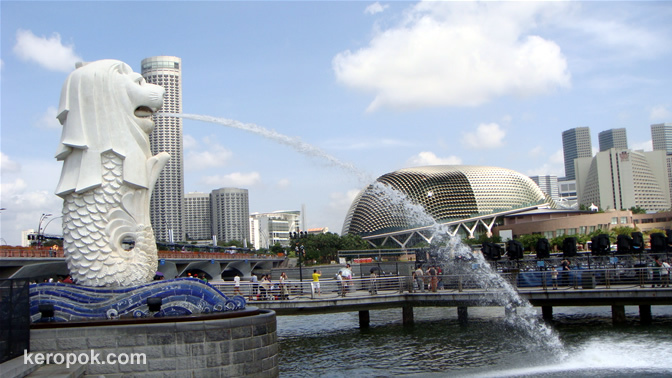 The Merlion and the Esplanade Theatres. I think it's my photo of the year. Travel round the world with these Daily Photo bloggers from other cities on Planet Earth. Due to different time-zones, some photos might appear at a later time. 2 Pieces of the Berlin Wall in Singapore. Long Taxi Queue, but no one's boarding the cabs.